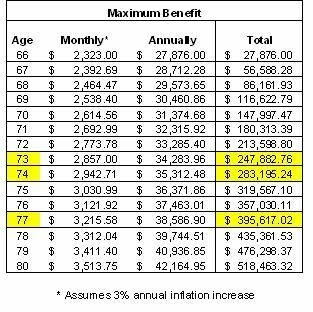 The maximum social security benefit for 2009 for a person retiring at full retirement age (66) is $2,323. This is based on earnings at the maximum taxable amount for every year after age 21. The total paid into the system by, or on behalf of, the recipient by the age of 66 is $266,377 ($235,042 of this since 1980). The total paid in by the age of 66 with 3% compound annual interest is $394,785. By the age of 74, the recipient will receive a full return of the amount paid in on their behalf without interest. By the age of 77, the recipient will receive a full return of the amount paid in on their behalf with interest compounded at 3% annually. Assuming the funds continue to receive a return of 3% through the annuity phase, the funds would last up to the age of 80. So by the age of 74 the total paid in by the recipient plus amounts matched by employers are exhausted. If the government were able to achieve a meager 3% rate of return, the total savings at the time of retirement would be exhausted by the age of 77. Assuming a 3% return on investment during the annuity phase, the funds should last through the age of 80. However, in reality, the average monthly benefit for social security recipients is only $1,061 per month or $12,732 per year in 2009. There are currently some 51.8 million recipients receiving some $55.0 billion in benefits each month. The only problem and it is a major problem, in fact it is a problem many times worse than the alleged health care crisis, is the fact that the government has stolen the Social Security Trust Fund. There is no trust fund. There are ‘no’ dollars in savings for the government to invest and receive even a meager 3% return. Every dollar paid into the fund this month will be spent this month, and then some. Worse than that, the Federal Government has run up a National Debt of $11 trillion, and intends to increase this debt by another $9 trillion over the next 10 years. With the peak of baby boomers hitting retirement age in 2019, a $20 trillion National Debt, longer life expectancy, and a smaller workforce, how are politicians going to be able to keep this “ponzi” scheme going? It is clear to me that Washington, DC cannot be trusted with taxpayer’s money. We need to get the Federal Government the heck out of the retirement business. And don’t even talk to me about letting the government take over health care. I’m not hearing it. We need to work on solutions that will allow American citizens to save for their own retirement, and to be able to pay for their own health care. At the same time, we have to figure out how to untangle ourselves from this massive ponzi scheme which politicians have gotten us into. As far as I’m concerned, any solution that involves spending another dollar of taxpayer’s money better include a detailed cost benefit analysis. Any solution to the problems of our time that doesn’t involve drastic cuts in spending by the federal government is not a solution. Great article. I totally agree, I don't want the government to get any more of my money until they can fix the problems that they've already created.